Dotguard offers an advanced parts-based identification and theft-deterrent products for the motorcycle, ATV, scooter, snowmobile, PWC and marine industries. DotGuard progams are fast and simple to apply, low cost, and are all backed by a police accessible National Vehicle Registration database. Available for sales, F&I, or service departments, or for use with existing theft warranties, DotGuard theft protection labels may be fully customized for any agency or dealership, and will allow a dealer to uniquely identify any vehicle, part of any vehicle, or any genuine part or accessory fitted or sold by that dealership. Each any every label manufactured and supplied by DotGuard is absolutely unique. 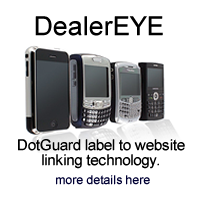 This ensures that DotGuard not only complies with new US Government parts marking standards, but ensures that the program may be fully customized for each dealer and their customers. Compare DotGuard to other technologies here. 2) Labels are pre-ordered and arrive at your dealership pre-coded and ready to install. 3) Marketing materials and a welcome pack are provided to each new dealership. 4) Labels can be fitted within seconds by "get-ready" personnel using simple peel and stick application. No chemicals, no adhesive - no mess, no fuss. Warning window decals are also provided. 6) DotGuard theft protection program is then sold to a customer typically in conjuction with existing limited theft warranty programs which ensures that if a vehicle fitted with our labels is stolen and not recovered within 30 days, then an attractive theft benefit is paid to your customer.